Today I’m on a deep dive into a newly released trial that has the potential to change the way we manage chronic, stable atherosclerotic disease. The trial under the spotlight is the COMPASS trial (full text PDF here) published online in the NEJM on August 27, 2017. It was launched at the European Cardiology Society (ESC) meeting. COMPASS (Cardiovascular Outcomes for People Using Anticoagulation Strategies) is a massive three-armed randomised, double-dummy placebo controlled trial looking at three different anticoagulation strategies for patients with “stable atherosclerotic disease.” In total more than 27,000 people were recruited. The trial took place in 602 recruitment centres in 33 countries which included patients from all continents. The trial is still ongoing as it involved 2 separate trials – one looking at the three anticoagulation strategies which has now been published; and another looking at the effects of pantoprazole on bleeding outcomes (still in process). The current published article is the result of the anticoagulation part of COMPASS being stopped early due to interim analysis observing a benefit in the combination arm in February 2017. This grabbed a bit of media attention and even got headlines in the mainstream media (see Reuters article). More on this later. It should be stated that this trial was sponsored by Bayer who produce both rivaroxaban and pantoprazole. The market for these agents would be greatly expanded if it were found that they conferred a benefit to such a common indication as “stable atherosclerotic vascular disease.” This is high stakes stuff! I am going to ignore the ongoing pantoprazole trial for simplicity. I will also largely skim over the 3rd anticoagulation arm (rivaroxaban 5mg bd only) as it did not really get a guernsey. The easiest way to analyse this trial is as a comparison of aspirin 100mg EC + placebo vs. aspirin + rivaroxaban 2.5mg bd. So lets describe the trial using the PICO template and later I will delve deeper into some of the hazy details. As stated this was a big, international trial. The majority were “Western white” folk. About 38% were non-white, mainly from Asian countries. The average age was 68 years and about 78% were men. They were typical of the type of patients we envisage when we think of vasculopaths – hypertensive, some smokers, diabetics… all the usual suspects. 90% of the patients had coronary vessel disease and 27% had peripheral vessels disease (so 17% had both). As one would expect -they took a lot of the medications we love to prescribe ACE-I, CCBs, statins, diuretics and B-blockers. The beauty of such a large trial is that there is no baseline difference in any of the groups’ profiles. The inclusion criteria seem fair enough to me – the patients needed to have documented coronary or peripheral vessel disease and those who had coronary disease only and were under 65 years old needed to have 2 other risk factors or documented disease of 2 separate vascular beds. These are the folk we would all usually prescribe aspirin for secondary prevention as per every guideline out there. The study included 1448 patients who had undergone CABG (bypass surgery) and went straight onto be randomised. For me this seems like an odd inclusion as this group clearly has specific risks and does not really reflect the patients we are seeing in outpatient care and deciding how to manage. I would think that group should be analysed separately… but I could find no way to break this down in the data provided. These exclusion criteria would remove a good proportion of my patients from the trial. So be aware of this before reaching for the script pad! This trial also employed a “run-in period” where patients were given aspirin + placebo rivaroxaban for a period and reviewed for adherence, side effects and adverse effects. In this paper 1645 (nearly 6%) were excluded for ‘adherence concerns’. I find this problematic. This seems to create an idealised population which is divorced from the reality of our daily practice. It would be great to know about the side effects, non-compliance etc in advance…. but that is no how medicine works! I suspect that the use of a “run-in” phase will remove some patients who we would struggle with in the real world, enhance the Hawthorne effect and may improve the performance of the intervention artificially. The use of aspirin is really the gold standard in secondary prevention – and as such this would be considered the control group. The primary outcome was a composite one [not sure why, it makes for tough analysis]. It was one of: – cardiovascular death, stroke, or myocardial infarction. Each of these was defined by valid measures. (Note the primary outcome was NOT “all cause mortality” which we do bang on a lot about here on the blog… it is probably the best measure of such an intervention given the balance of risks and harms. and death from any cause. The measure of safety / harm was defined as the International Society on Thrombosis and Haemostasis (ISTH) criteria for major bleeding and included fatal bleeding, symptomatic bleeding into a critical organ, bleeding into a surgical site requiring re-operation,or representation to an acute care facility. 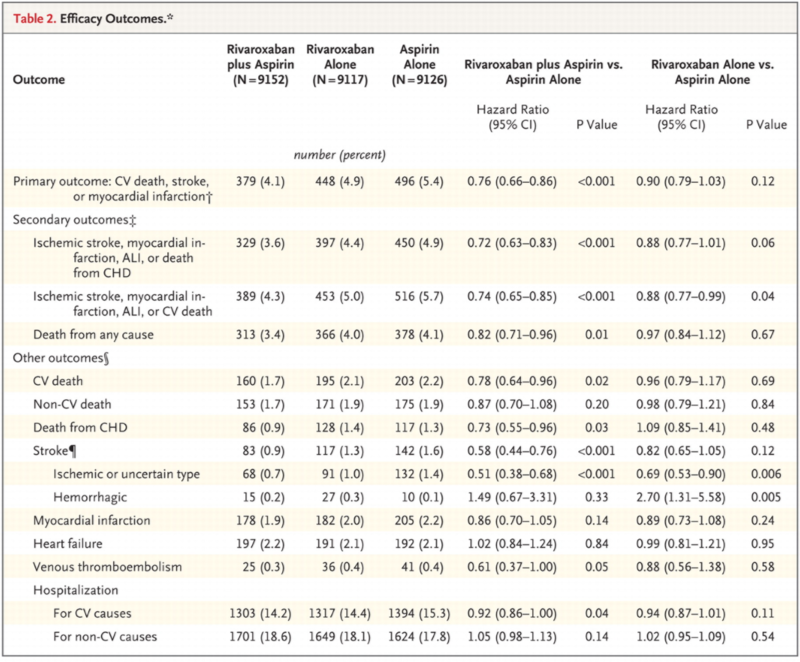 As you can see – there was no real statistical difference between the aspirin alone vs. the rivaroxaban 5mg bd groups. All of the confidence intervals cross or scrape 1.0. So I will focus the rest of the analysis on the comparison between the aspirin alone vs. rivaroxaban + aspirin groups. There was a significant difference between the groups favouring the combination when we look at the primary outcome and the other composite end points. So that looks good. The primary outcome occurred in 1323 patients of the 27,395 who completed run-in and were randomised. This is 4.8%. However, the power calculation was based on a total of 2200 primary events, which was estimated to need 27,400 enrollees. So it appears that the total number of patients enrolled was very close to the magic power calculation requirements…. but, the number of events falls way short by nearly 900 “primary events” due to a lower than predicted event rate. It is important to appreciate this distinction in an event-driven trial. To get enough events they would have needed to recruit about 45,500 patients to achieve the power set out in the original calculations. The COMPASS trial was halted prematurely after an interim analysis by it data monitoring board found the benefit of the combination therapy crossed the predetermined life of significance. This decision was in keeping with the rules laid out in the trial protocol. But what does early stopping do to the outcomes? Early stopping has the effect of overestimating the benefit of the intervention. This is especially true of smaller trials, however even in large trials like COMPASS it can have a significant effect. There are many examples of clinical trials which have been stopped early and then subsequent data from other sources have shown the benefits to be small or non-existent. The other harm that can come from early-stopping is the subsequent difficulty in carrying out a subsequent trial which may confirm or refute the hypothesis being tested. So what does this mean? It is a tricky ethical area for clinical researchers. I think for COMPASS it means that we should be cautious with our adoption of it s findings. The most likely effect is a small overestimate of benefits of the combination therapy – and given the small benefit over risk – this could be enough to land us at equipoise. About half of the benefit seen with the combination therapy over aspirin alone was due to the reduction in ischemic CVAs. Now if you scour the fine print you will discover that only 1.3% of the patients in the trials were found to have AF as a comorbidity. This does seem low in a cohort of vaculopaths aged in the 60s. In a recent Australian survey the baseline rate of AF in men > 55 years was closer to 6%. SO we may have a problem here. If the AF was ‘occult’ then we are looking at a cohort who have AF, are at risk of CVA and therefore would more likely benefit from a more aggressive anticoagulation strategy. A proportion of the benefit seen in the COMPASS trial may have evaporated if we excluded folk with AF as we deemed them to be in need of more than “just aspirin” at the outset. AGE DRIFT of BENEFITS and HARMS. As you can see – if you break the numbers down by age groups – < 65, 65-74 and > 75 a clear pattern emerges. The benefits gets smaller to the point of non-significance as one gets older and the risk of major bleeding goes up to double once you are over 75. So that delicate balance between good and bad is tilted by the march of time. It may be that there is a benefit to the combination in younger folk which tilts to a nett harm after 70-odd years. This makes complete sense in my mind and I think we need to keep this in mind when applying this data in the real world. The COMPASS trial is big. Your local friendly Cardiologist / Physician / Hospital or Vascular Surgeon will likely be getting bombarded with media releases, pharmacy reps and guidelines based upon this trial in the near future. As GPs we are in the unique position of having to counsel, monitor and tweak our patients medications to suit their needs over the long term. This trial will spur a push towards more aggressive anticoagulation combinations in those patients we previously plied with simple willow bark extract! We need to know what the data actually says about the risks and benefits of these more aggressive combinations. To my mind the benefits and harms are closely balanced. Maybe towards benefit in younger folk, harm in older people. There are a few big issues I have with the trial such as the early stopping, the choice of outcomes and the large drop out due to “run-in failure”. I for one, am not sold just yet. Unfortunately I do not imagine this question being re-examined on such a scale anytime soon. We need to need to know what this data really says, look past the headlines and help our patient’s decide what risks they are prepared to accept for some small gains. Please have a read of the trial, look at the raw numbers and make up your own mind.